I was very excited to be given the opportunity to readand review this book. My granddaughter Haylee spent the day with me and we went to the library and picked out some books. When we returned The Journey of the Noble Gnarble was here. I told her that I was asked to read it to her and she had to tell us what she thought about it. She asked me if she was supposed to tell me if she didn't like it. I told her yes, I wanted her to be honest. So she said okay. After dinner and her shower, (she's spending the night) we at down to read the books. We read The Noble Gnarble last. Haylee is five years old and starts kindergarten this year. She has always loved books. So she opens the book and I tell her the title and she asked what a gnarble was. I told her we would figure it out. 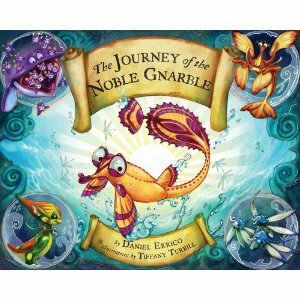 I read the first page and she said, "Oh a gnarble is a fiish, that's a funny name. I like it. He's beautiful." I read about him dreaming and she said, "that's a great dream, he should try it." We read along and the fish were telling him it couldn't be done. She said to the gnarble, "Don't listen to them their stupid." I asked her why she thought they were stupid and she replied, "Because, maybe they're afraid to try it so they don't want him to try it." I said, "Maybe there's a lot of danger out there and he shouldn't try it. Maybe they know this." Her reply was, "That's stupid! If he wants to see the sun and go to the top he should do it. It's what he dreamed about." Then when he gets eaten she was sad for the fish. But, she looked at me and said, I bet he finds a way out." When we had finished the book she cheered and said, "See I told you he would make it." She flipped back to the beginning and said, "They told him he couldn't do it becase his fins were too small, just like in Nemo. They said he couldn't becase he had one fin too small. Everyone was scared so they didn't want these fish to try it. But they didn't listen to the other fish. They said, 'I can do it.' When the other fish tried to stop them and eat them, they said no way, I'm going to do it cause it was their dream." I loved the book for the bright colors and the wonderful story. I loved the way the author writes in a Dr. Seuss way, very lyrical. I loved the way the story lessons were conveyed so that my 5 year old granddaughter understood them. I am very impressed with her ability to make the connections she did. I teach 6th graders and many of them struggle to make connections. Now here is the kicker. In all the other books we read, she made comments and observaions. She did not make connections the way she did here. The message is such a positive one. Any child whose parents try to instill that positive, never give up, type of attitude in their child will be able to make those same connections because of the way the book is written. I hope there is more by this author. My granddaughter said to tell you she really, really liked the book. She asked if the author was going to write about the other fish and their dreams. I told her I didn't know what the author would write next but I would let them know she would like to read about the other fish. So you have not only my review but the review as seen through the eyes of my granddaughter. Thank you for allowing me to read this book in advance. I loved it and will take great pleasure in re-reading it often. This is a book to send to all of my grandchildren.